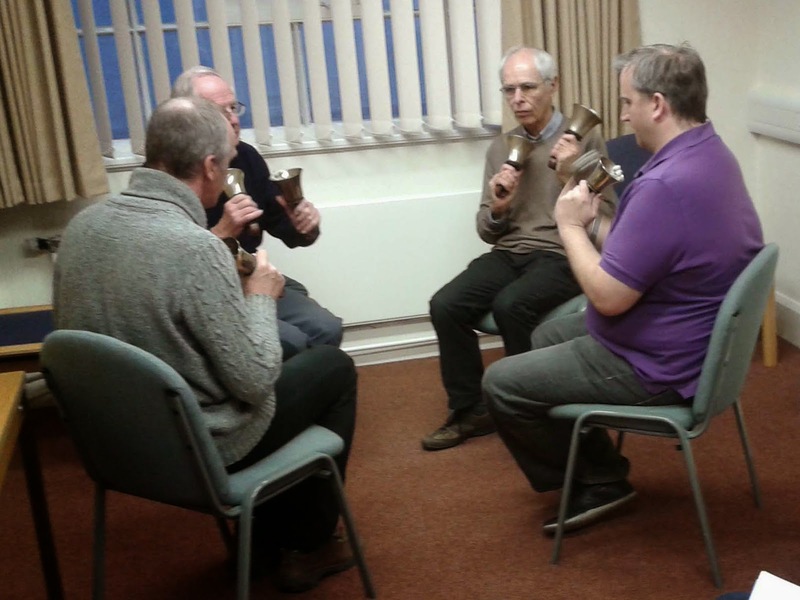 The Ely DA Handbell Day, held on 13th December 2014, involved twenty eight ringers and eighty two bells. Thanks to Christ's College for the space and especial thanks to Adrial for organising food! If any of the participants wants to follow up, please contact me. Click Play on the control below for a composite audio of the day. Tea in the Guildhall, Burwell (located in St Mary's churchyard) from approx 4.00 pm. £15,700 plus £15,000 loan to Meldreth. The business meeting will also include the ratification of Robert Bramley as Bell Fund Trustee. Over 40 ringers were at the tea and meeting, the grants were approved and the Bell Fund Trustee was elected. Quarter peals were rung at Exning, Haddenham, Over, Stretham and Wilburton, and attempted at Fordham, Isleham and Soham. Details are here. Congratulations to Paul Seaman (then Peal Secretary of the Ely DA) who rang his 1000th peal (5056 Bristol Surprise Major at Great Shelford), his 1000th quarter peal (1320 Shelford Delight Minor at Little Shelford) and rang at his 1000th tower (Little Eversden) all on 11th July 2014. The photo shows the peal band at Great Shelford. 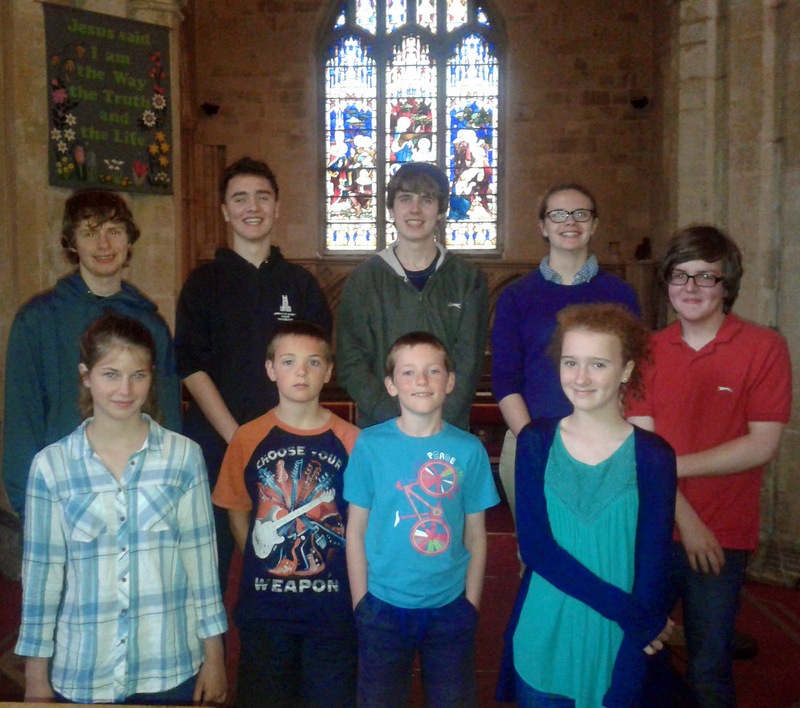 Congratulations to the Ely DA Young Ringers who achieved a C+ grade in the Call Change section of the Ringing World National Youth Contest at Worcester on Saturday 7th July. This places them equal 7th out of 10 bands in the section. Bedfordshire were the winners, full results are here. Barbara Le Gallez writes: For some of the band, this is their first time in a striking competition. We can only be proud of their hard work and team spirit, whatever placing they achieve. 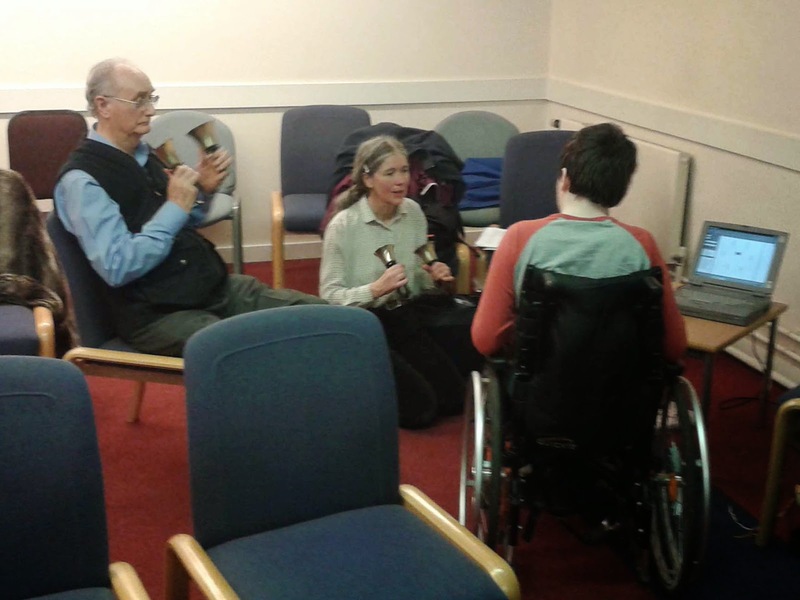 We are very grateful to all who have supported us, in particular to the parents who have driven their children many miles and to the ringers at Longstanton and Histon who kindly let us hold practices there. Special mention must be made of the two reserves, who were essential to our practice routine, as well as providing the row counter on competition day. We are all indebted to Alan Winter, our patient and supportive team coach. 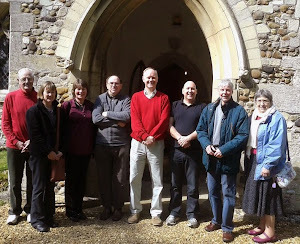 The photo shows 9 of the 10 ringers, taken at Histon church when we did a dry run under competition conditions on Sun 29th. John Hinton is missing (their car was not working). 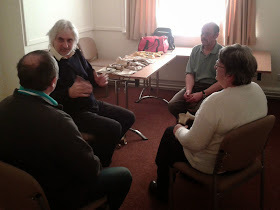 This was held on Saturday 3rd May in the Ely District. 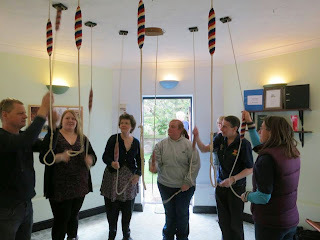 The day started with the Inter-District 8-bell striking competition, held at Longstanton. The Huntingdon District was placed first, closely followed by the Ely District, with the Cambridge District in third place. 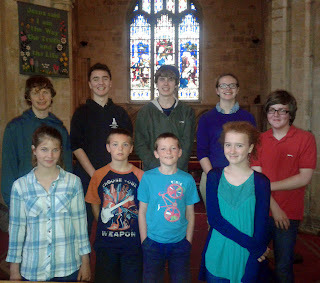 The Cambridge District band included a good complement of Young Ringers, which is encouraging for the future of ringing in the Association. 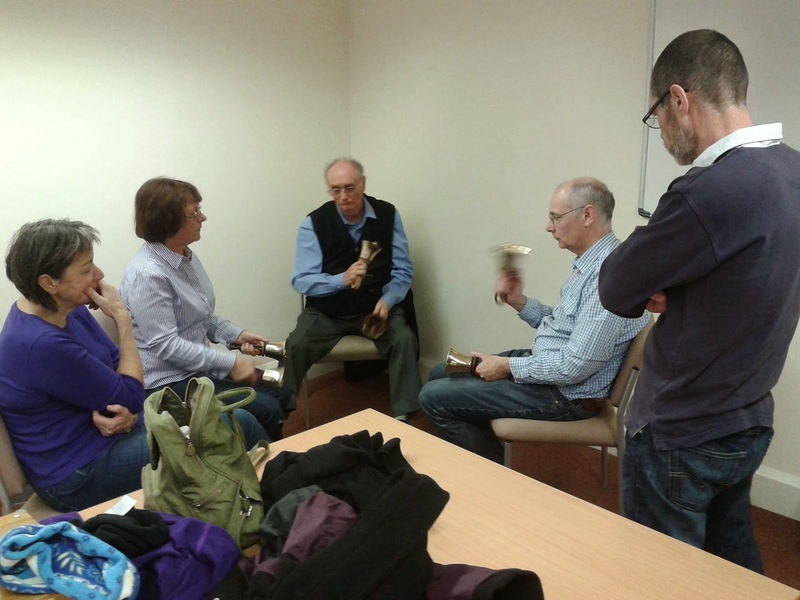 General ringing at Millcroft Campanile in Willingham was enjoyed by some ringers, and this was a first experience of a mini-ring for some Ely District members. Then we moved to Over for general and service ringing, service, tea and meeting. 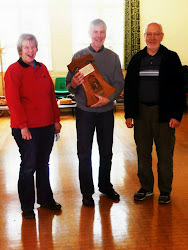 Thanks to Geoff Grayton and Ruth Bramley for the photos: The Huntingdon District team for the Striking Competition, Ringing at Millcroft, and Presentation of the E H Mastin trophy to Phillip George on behalf of the winning team. The following article, about ringing for the centenary of World War 1, was printed in the Ringing World recently. On behalf of the PR committee of the CCCBR, it is being sent out to societies, as it may be of interest to officers and members. The article includes a request for feedback of views, which would be very welcome, and can be sent to Barrie Dove, the chairman of the PR committee (barrie.dove1_at_ntlworld.com), or of course to the Ringing World letters page. The centenary of the 1914-18 war is approaching, and it will generate a lot of public attention. The government has committed £50 million to make this a major event. The Culture Secretary is chairing an expert advisory panel to oversee a 4-year programme, building a commemoration ‘fitting of this significant milestone in world history’. Other key organisations have begun to plan their response. The Royal British Legion is ‘determined that the tone will be one of commemoration, not celebration; and that Centenary activities will be available to all and kept free of partisan or sectarian bias’. Churches Together in England recognises that there will be much debate about the nature of the commemoration and intends to help churches and local communities to work together. Other stakeholders include the Imperial War Museum, the Commonwealth War Graves Commission and the National Archives. A four year centenary will last a long time. The Government has already listed what it considers six key dates: the declaration of war in 1914, the start of the battle of Gallipoli in 1915, the first day of the battle of the Somme and the battle of Jutland both in 1916, the battle of Passchendaele in 1917 and the 100 days from the start of the Battle of Amiens to the Armistice in 1918. While the nation will wish to remember the heroism and sacrifice of so many during the war, there will undoubtedly be many who are uncomfortable with the focus on so many horrific events. Some will undoubtedly think that the only event worth marking is the Armistice in 1918 (though cynics call that the start of a 20 year cease-fire until the next war). What will almost certainly generate significant interest, though not on the Government’s agenda, is when the carnage briefly paused at Christmas 1914 and the opposing troops played football together. As ringers we will all hold personal views about the war and what should and should not be commemorated, but as the custodians of the nation’s bells we have collective responsibility to use them in ways that enhance public sentiment at such times, whether to enhance rejoicing, to dignify mourning or to support sober reflection. 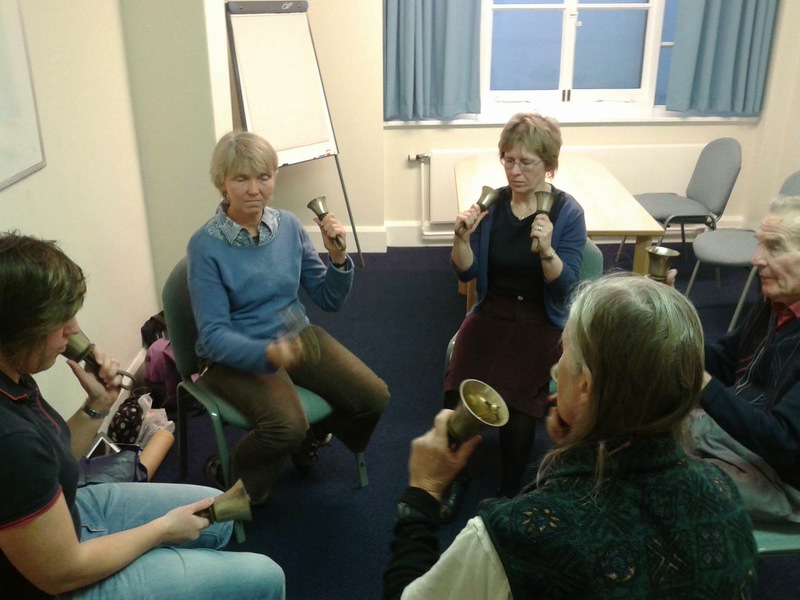 The Central Council is working with the other bodies involved in planning WW1 centenary events, to ensure that bell ringing can make a full and appropriate contribution, and we will keep ringers informed of progress, especially where there are requests for widespread national ringing. 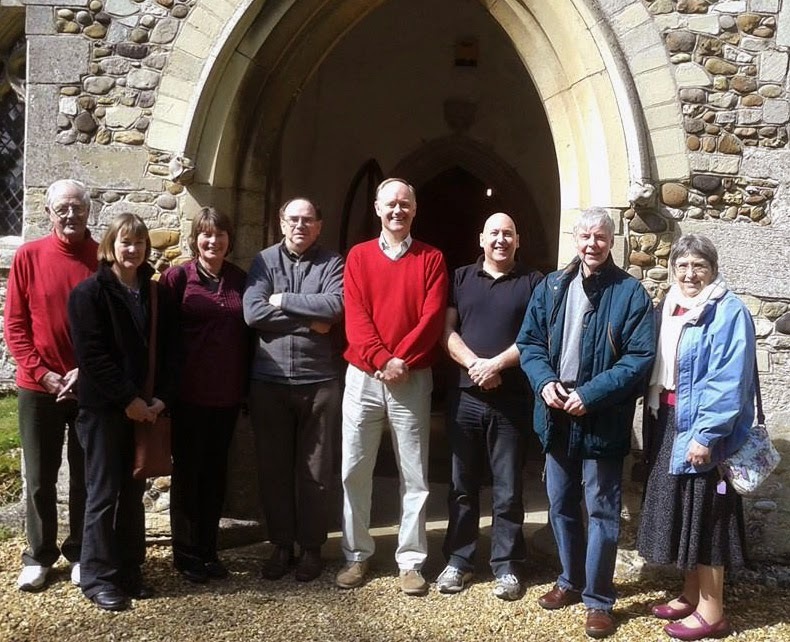 In representing the ringing community it would help us to know the thoughts of ringers at large about the emphasis and type of ringing that you would like to contribute to this centenary. This was held on Monday 6th May at Ickleton. For information, the Agenda is here. Sheila George did not seek re-election as Treasurer, and was warmly thanked for her 14 years in the post. We welcome Nicholas Small as the new Treasurer, contact details are here. The committee's recommendation that the acting webmaster be appointed as webmaster was ratified by the meeting. The other Association officers were re-elected to their existing posts. 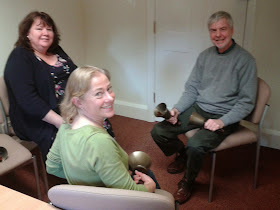 A grant of £300 from the Bell Restoration fund to Ramsey was ratified by the meeting. The AGM was preceded by the inter-district 8-bell striking competition. This was a close contest, Ely District rang Plain Bob Triples and was placed first with 125 faults, Huntingdon District rang Grandsire Triples and was placed second with 137 faults, Cambridge District rang Plain Bob Major and were placed third with 142 faults. 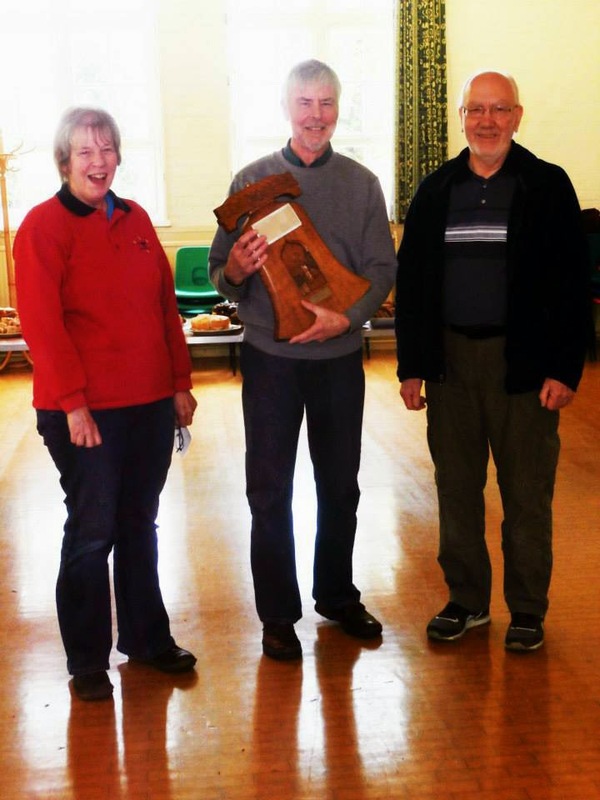 An article by Ely District ringers is here. The 2012 Annual Report was received by the AGM. It is recognised that there are errors in the printed copies, particularly in the District pages. A list of corrections is here. Sue Marsden reports: "The Ely DA was well represented at the RAF Guild 40th Anniversary Weekend in London on 23rd and 24th March. 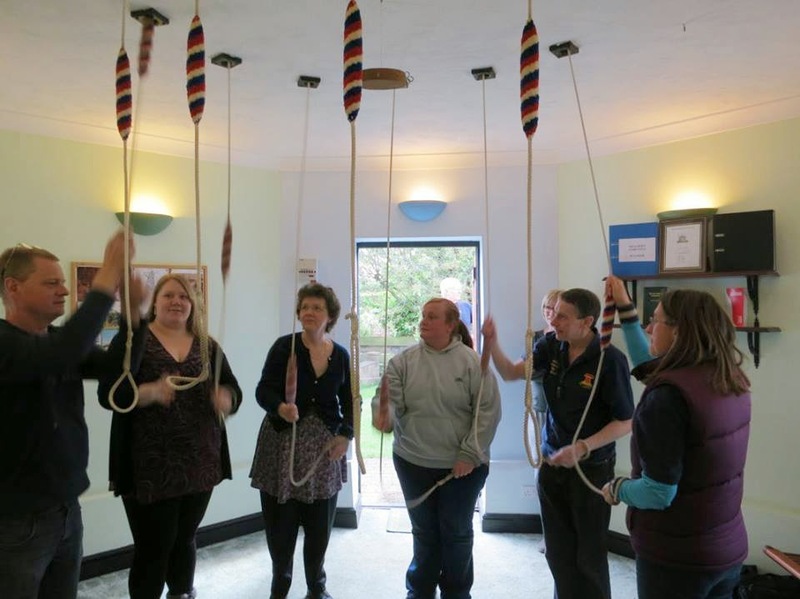 Ringing took place at both Uxbridge towers, which was where the Guild was formed in 1973, and at St Johns Hillingdon, before we met at the Victory Services Club for the AGM and anniversary dinner. Hunts District ringers Michael and Bridget White (Hemingford Grey), John Haas (Kimbolton) and Ursula Bulpitt (Ramsey) with Sue Marsden and Colin Johnson from Chatteris joined about 40 RAF Guild ringers from all over the country, including Founder members Mick and Betty Stracey who are former Ely DA members and parents of Andrew who rings at Chatteris. On Sunday Michael, Sue and Colin were privileged to ring in the peal specially arranged to mark the anniversary (details here) at St Clement Danes, the RAF church, after a service taken by the RAF Chaplain. If there are any other former RAF ringers in the Diocese who would like to join the Guild, please contact any one of the above ringers." The band who rang in the St Clement Danes peal. Thanks to Michael White for the photos. The Haddenham bells and frame, shown in the photos below, were included in the Association Tower Maintenance session on 2nd March. Thanks to Sam Bramley for the photos.